Chasing Davies: The Bachelor: It's more about the Fashion, than Brad! The Bachelor: It's more about the Fashion, than Brad! Are you guys going to watch this season of The Bachelor on ABC? I know there is a lot of opinions about Brad being the bachelor again... and some people are down-right mad about it. I will be watching... but I have my own reasons. She's also a great dresser. Fun fashionista. So, you're in luck! A sneak peak at her out of the limo and meeting Brad for the first time and where her dress is from...Oh and who is she? She is Lisa. You can see her bio and pretty picture here. Photos of Lisa in her darling one-shoulder blue dress. You'll have to watch tonight to see her in action, and all the other cute dresses the girls will wear! Oh, and you'll also have to watch the show to see what she's wearing on her feet. :) It's a fun little surprise. So the anyways, the dress is from Arden B. 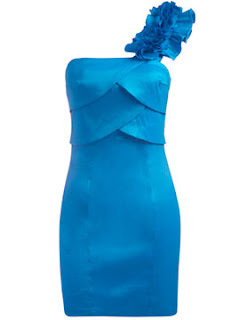 - $30 blue one-strap Taffeta dress. So cute! Photos are from Wetpaint and BuddyTV and found via Google, not through Lisa.